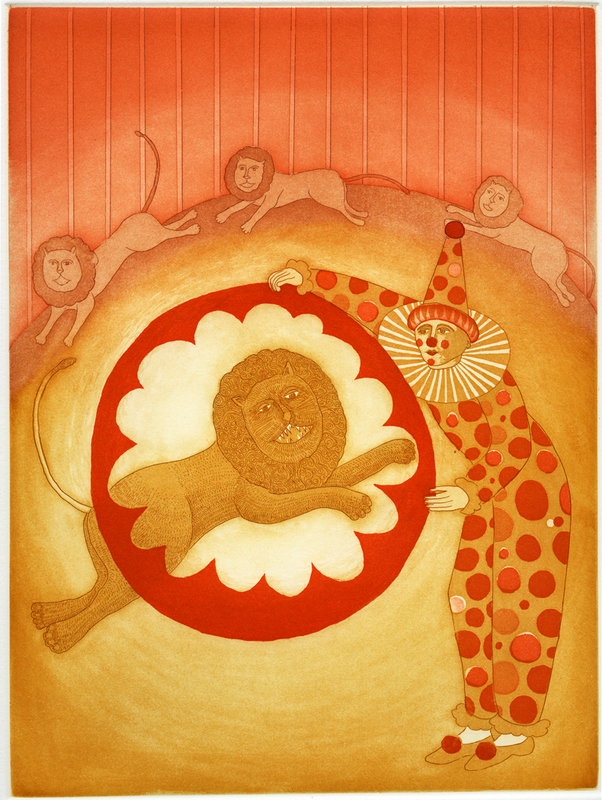 With great panache and humor, standing in a cage surrounded by wild lions, our clown skillfully guides the beasts, and watches as they jump through his hoop. He is calm, like Daniel in the lion's den, and this amazing feat excites the audience. As the viewer carefully examines the lions, one begins to see elaborate and complex patterns found within the stands of hair in the lion's fur and mane. An original, hand-printed serigraph published by the artist with collaboration of master printer Richard Spare at Clarendon Graphics, London, England. Dimensions: Image: 10 ¾" x 8"
Colors: 2 multi-colored plates printed.